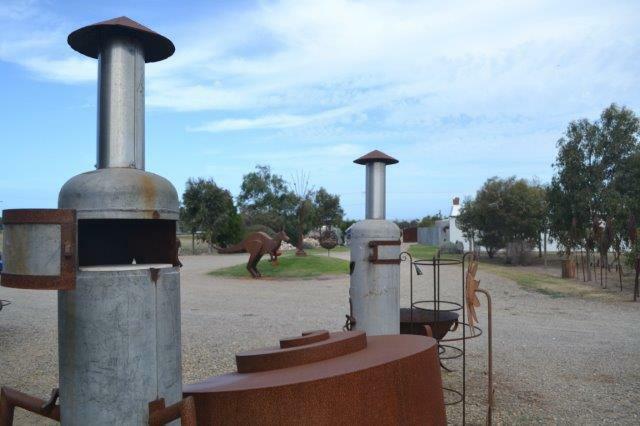 Add a little interest to your Sunday drive with a stop at Blue Temper Ironworks Gallery. 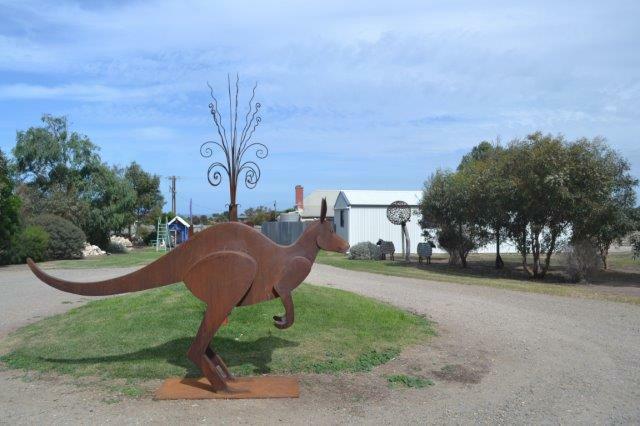 Located on the main road from Goolwa to Port Elliot, it is easy to find and has its own parking. 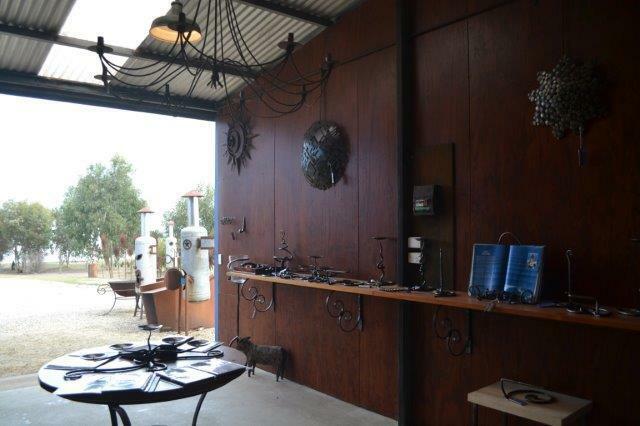 Blue Temper Ironworks is the work and display space of the talented Chris Murphy. 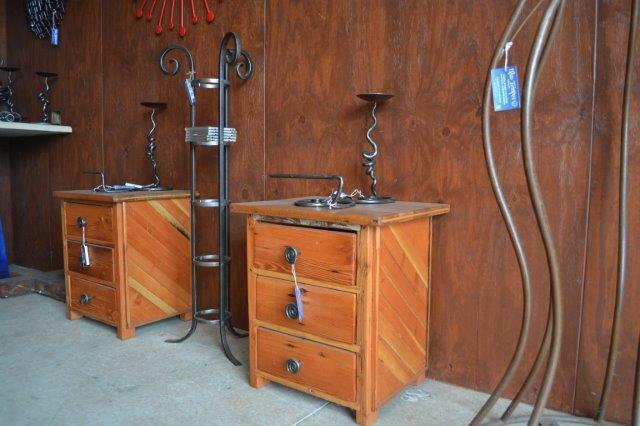 Blue Temper Ironworks Gallery features many beautiful pieces to jazz up your outdoor living areas. 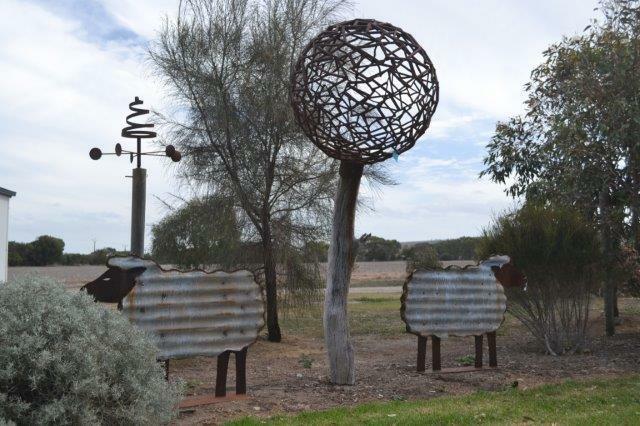 At home among the gum trees are kangaroos, sheep, dandelions and Neptune balls. Fire bowls with curlicues and spaceship pizza ovens hidden inside gas cylinders are some of the outdoor functional items with durability and pizzazz. Sheep graze blissfully in the bushes, leaving all the intellectual activity to the Thinkers Sphere. Swirly drawer knobs, mirrors, candelabras, shelf brackets and wall ornaments are but a few of the smaller decorative and functional pieces that Chris makes. 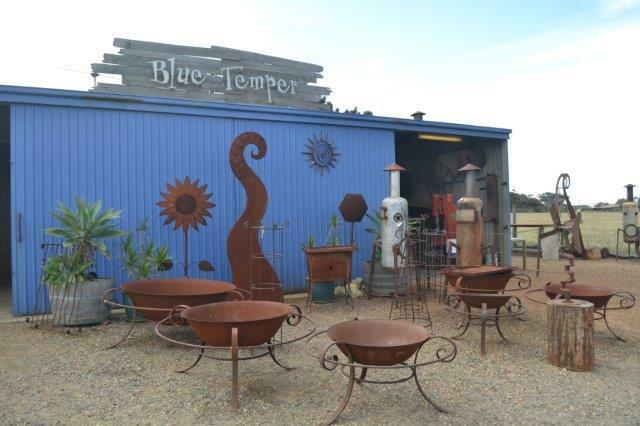 Blue Temper Ironworks is also the birth place of many of my favourite Brighton Jetty Classic exhibits. Make a Wish (2016) entices you to stand on tiptoe and blow the giant dandelion seeds away. Who could forget Gene the Giraffe Standing Tall on Surf-ari? 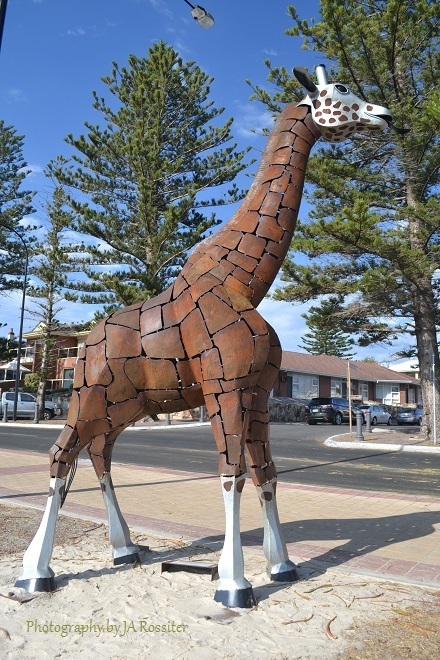 Here's Gene hanging out at Brighton Beach for the 2014 Brighton Jetty Classic Sculptures. Gene had many visitors interacting with the sculpture exhibition by trying to guess the number of scales on his body. They hoped to be the lucky winner of a Blue Temper Ironworks voucher. Gene, himself, was a winner of the People's Choice Award. Gene now watches the trams go by in Maxwell Terrace, Glenelg. 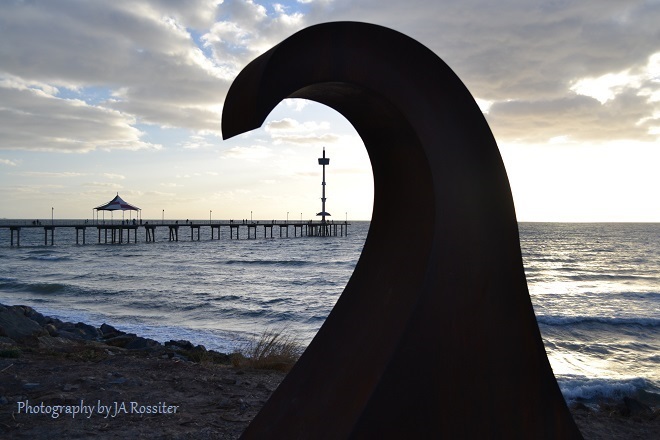 Wave of the Day, winner of the Outdoor Sculpture, posed dramatically for photographs in 2013 at the Brighton Jetty Classic Sculptures. 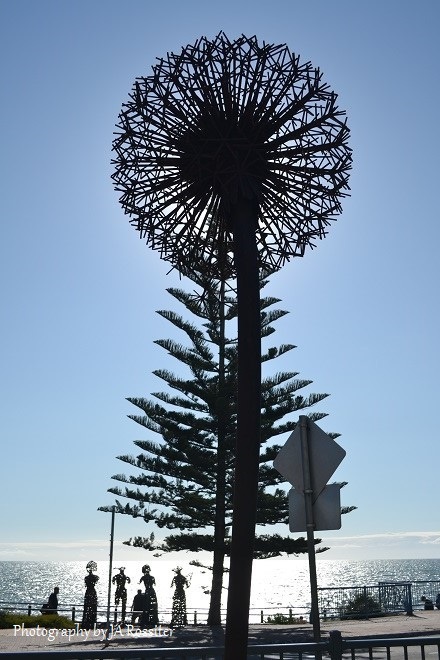 It is currently installed, but on loan, at Middleton Point. The local community are raising funds to keep Wave of the Day at Middleton as a permanent installation. 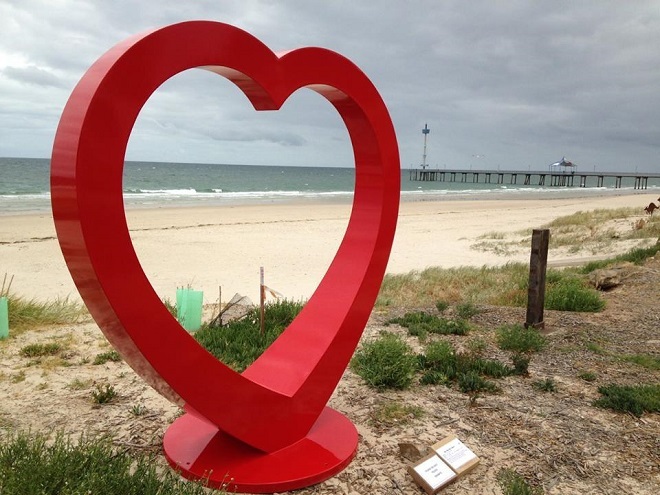 My Big Red Heart, by Jayd Van Der Meer, (another creative sculptor at Blue Temper Ironworks), had visitors to the sculptures queuing to stand framed by the heart for their next romantic facebook profile pic, me included. What will be the next inspiring sculpture to be born at Blue Temper Ironworks? Pop in and see. All photographs of Chris Murphy's work by JA Rossiter.